In case you aren’t up on your abbreviations, that’s Red Headed Step Child, keeping in mind and continuing the whole family theme. Today is going to be yet another rather dry TotD that continues to prepare us novice Family creators on our journey into full family parenthood. So let’s delve further into family creation by examining the different types of families as well as some behaviors of the different categories. So there’s three basic things you should get out of today’s TotD. 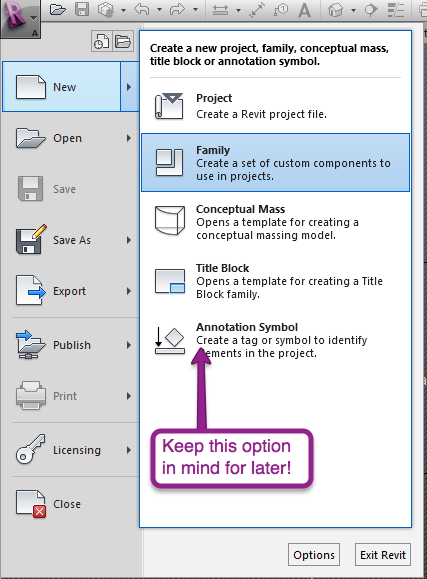 These are the immediate family members of your Revit project. They are always in the project no matter how hard you try to get rid of them, one will always be there. A good example of these families are your Assembly Families: Walls, Roofs, Floors, Ceilings, Stairs, Rails, Curtain Walls, etc. You can not delete all types of a System Family from a project! Kinda like an immediate family member >_>. Some unexpected System Families you may not have thought of include Dimensions, Views, View Titles and Elevations! 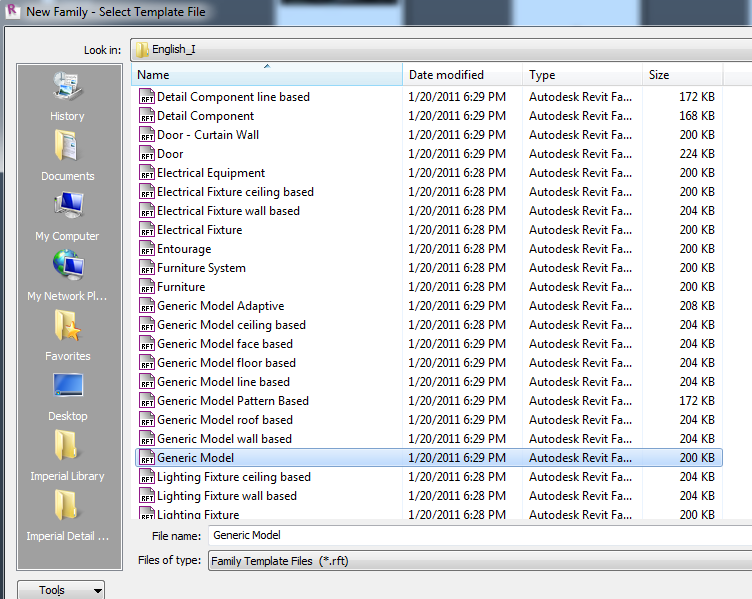 These are the RFA files that you bring into a project. Much like your extended family, these are the hardest to stay in touch with, get used to and understand. 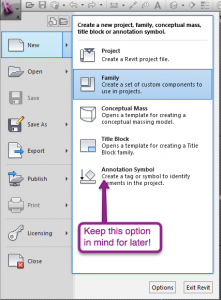 These are the major customization components in Revit. Doors, Windows, Columns, Beams, Plumbing Fixtures, etc. More importantly your detail components, tags and many family types that are nested into system families like Mullion profiles for curtain walls, baluster families for rails and so on. You can start to see how these different family types begin to work with each other. 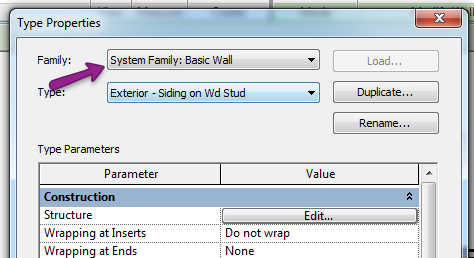 Definitely the Red Headed Step Child of Revit families. 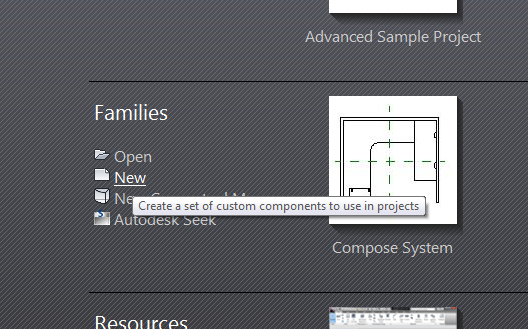 I say this only because of the love/hate relationship that Revit users have for In-Place families. I know people that use In-Place families exclusively cause all of their projects are 100% one-off custom residential projects. I know some people that create an RFA for a 4″ section of Chair Molding that will only ever be used in one project simply because of their seething hatred for in-place families. Then there are those of us who preach against In-place families, (but then tell you to use them when you can with their tongue in their cheek while winking). In-place families are well suited to one of situations that you really wouldn’t benefit from the parametric capabilities or mass use of a User Family. In-place families are also beneficial when you need to create custom families for system family categories, like walls and ceilings, to help better compatibility with other objects of the same category (think wild and crazy bulk head, wall category, but not that easy to model as an actual wall). 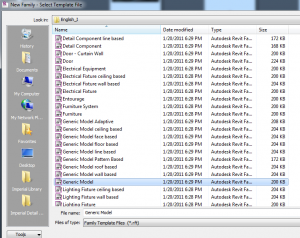 SO these are the basic building blocks of Revit. Simple right? See, nothing to this family editor stuff! 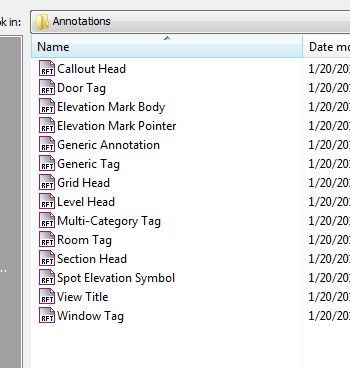 Well, thanks again for stopping by and I look forward to having you again for another Revit TotD! Oh come on.. I’m talking about REVIT families. Me: “Definitely making families, I am very comfortable making families…” I look up and all three of them have their mouths hanging open. Familiarize you with Families and their Creation. 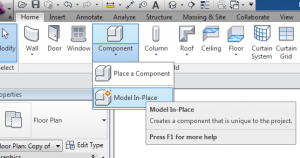 Get you started on geometric modeling inside the family creator. Cover Constraints and geometric parametrics. 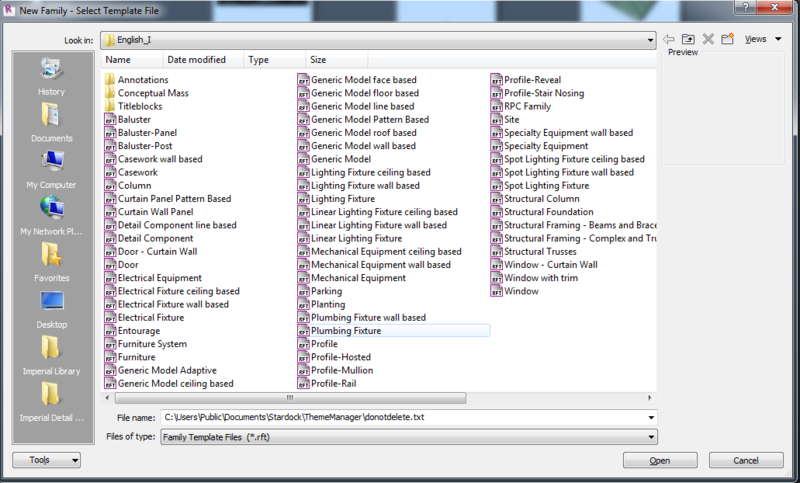 Look at the functionality of family parameters and family catalogues. Differentiate between model and annotation families. Experiment with Nesting and Shared Parameters. I will probably NOT get into Conceptual Design Environment families (adaptive components and such) just so I have something to discuss in yes another series down the road. Besides, I think Zach over at Buildz has that pretty well covered. I will probably also avoid covering EVERY single little parameter and detail that is available for family creation. Remember, 5 minute tips!!! When I tell people they will be working in the Family Editor, I can sense the panic and fear that ensues. It’s ok, it’s just Revit, with a few different options. To get there we either open a family or start a new family. While I suggest constantly looking at families both out of the box and that others have created (usually to see what NOT to do!) as the best way to learn about families, we’re going to start this series with looking at the new family template options. From the recent files page you can select new from the families or go old school and go R > New > Family. So here you are presented with your first “Oh shnap!” moment. That’s a large list of options and a lot of people probably just give up here and go find a book or blog that tells you what to do next. Do not fear. We’ll get to what all these templates mean, but for now let’s just pick the “Generic Model.rft” template. Tada! Family Editor. DON’T PANIC!!! 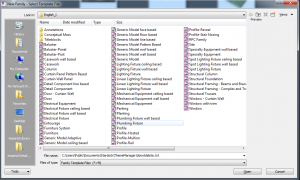 You’ll notice that your ribbon has some new options that are not available in your normal project mode, and some options are missing, like most of them. This is basically a Family Creation workspace (if you are familiar with Maya or 3DS, this term should be familiar). As we go through the series you’ll begin to understand why you can’t make walls or schedules in the Family Editor mode (in fact you may be ashamed to remember that at one point this was all alien technology to you!) 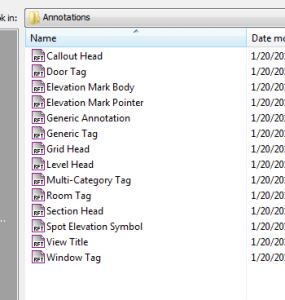 but for now open a few families that come with Revit and pay attention to their category, available parameters, the geometry, how the views are set up, etc, etc. I would suggest taking a look at a few families before moving on to the next post just to familiarize yourself with the environment and the options that are available. I can’t speak for you but this is how I learned the best when it came to families; by reverse engineering other families to see what makes them tick. Until then, thanks for stopping by and I look forward to seeing you around for another RevitTotD!